Every season, there’s one pitcher whose results completely undersell his skills as a pitcher. This year, it’s Zack Greinke. Through his first nine starts, Greinke’s strikeout to walk ratio sat at 70 to nine. Naturally, then Greinke’s ERA was 5.23 entering Tuesday night’s start against Tampa Bay. Those around Milwaukee started to wonder about the supposed ace, trying to find reasons for his failures, ranging from just losing his control in big spots to the old standby, his history of mental issues. Last night, Greinke finally found his ace zone, putting together easily his best start of the season. He went seven innings against a Rays lineup loaded with left-handed batters, striking out ten, inducing 11 ground balls in 16 balls in play, and now allowing a single walk. Such fantastic peripheral numbers are no stranger to Greinke on this young season. He struck out ten batters in his previous start against the Chicago Cubs, but allowed eight runs. This time, the results fit the peripherals: the Rays only managed one run on four hits. But there’s also an unsustainable effect in play when it comes to throwing pitches that are easy or hard to hit. If a pitcher throws a bunch of hanging curve balls that are getting smacked all over the field, the catcher will eventually stop calling for them. Or, he might learn that he can’t throw that pitch in that location, and make an adjustment. Hitters make adjustments, too — they’ll watch video, realize that a pitcher likes to spot a certain pitch in a particular location, and once they expect it, the results will change. 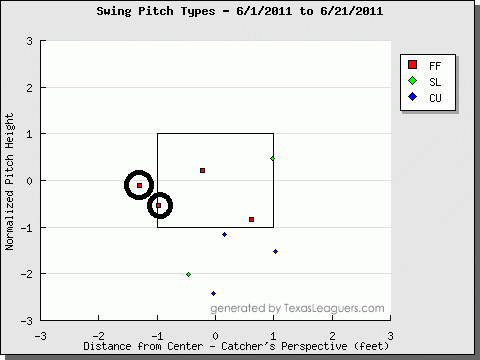 This may have been an issue with Greinke. He’s been giving up more home runs than ever before, and the easiest explanation is that he’s throwing more hittable pitches. Maybe he just hasn’t been as sharp from the stretch due to missing spring training, and that could partially explain his .500 BABIP with runners in scoring position. However, I would add yet another situation where pitchers can either benefit or suffer from good or bad luck, one which has been negatively impacting Zack Greinke this season. Greinke has made a number of fantastically placed pitches which hitters have still managed to place for hits, even home runs. The best example of this is Logan Morrison’s first two at-bats against Greinke during the Brewers/Marlins series at the beginning of June. The circled pitches here (image from TexasLeaguers.com) both resulted in line drive doubles down the left field line from Morrison. Those aren’t considered typically hittable pitches, and yet Greinke got shelled by Morrison. Every pitcher makes mistakes, and those mistakes usually get hit. Greinke’s mistakes have been hit, surely, but so have many of his objectively good pitches. Finally, his luck seems to be turning, and maybe in two more months his results will actually indicate just how excellent a pitcher Zack Greinke actually is. We hoped you liked reading Zack Greinke Finds His Zone by Jack Moore! What’s in a Height, Anyway? I put 100 bucks on the Brewers to win the pennant because of this article. Thanks. Payout is saweeet still.